I hate smells. Well not all smells, but artificial, perfumy smells are not my thing. Unfortunately, depending on the weather, I cannot always open a window to air out odor. So to get rid of the smell, in the past we would spray room freshener. Then I take a towel or pillow and attempt to fan the scent out. Not only are the smells of store-bought fresheners nauseating, but when you look at some of the ingredients, they might make you queazy as well. Benzisothiazolinone - possible immune system toxicant; irritating to eyes, skin, or lungs; possible organ system toxicity for use around the mouth/on the lips. 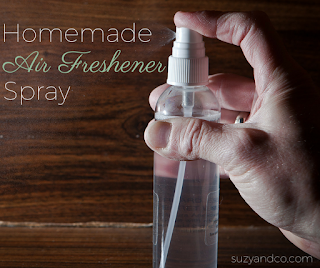 Most homemade air fresheners have baking soda in them. I tried it and I did not like that. The problem was that the baking soda clogged up my spray and would never stay suspended in the liquid. So one batch I decided to leave it out and it worked great. This air freshener smells 100 times better than a store-bought spray. Mix in a spray bottle and enjoy the smell of natural ingredients.